Two days ago I rode up Mount Hamilton, the hard way. I'm taking a bicycle tour soon, and so lately I've been riding around with a rack on my bike. Most of the time, I also have my bag attached, to help get used to that. But while there has always been stuff in the bag, it has never been fully loaded. Until Wednesday, that is, when I packed everything on my list into the bag and set off. To get a good feel for how the extra weight will affect me, I decided to ride up Mount Hamilton. And because I was especially worried about steep climbs, I took Quimby to get there. My bag is very heavy. I guess the heaviest thing I have is a laptop, even though it's a tiny little netbook. But I also have a camera and, apparently, about 20 pounds of other stuff. I'm pretty sure the bag is as heavy as the rest of the bike. I started feeling the extra weight as soon as I started up Silver Creek Valley Road. When I stood up on that surprisingly steep section of road, the bike was top heavy and clumsy. I'd have to do something about that. Quimby is very steep. From where I started at Murillo Avenue, it climbs 1600 feet in 3.1 miles, with an average grade of 10%. The extra weight didn't help, but I made it to the top alive, so I suppose it wasn't so bad. The most difficult kilometer of the ride was the top of Quimby, which averages 13.6%. When I got down to Grant Park, I shifted the heaviest stuff from my bag into its built-in panniers, to lower the center of gravity. That, plus a little bit of experience with the heavy bag, made bike much more manageable. When I rode up Mount Hamilton last week, I felt really strong. This time, with the added weight, not so much. But having said that, the extra weight is out of sight and, even when climbing, mostly out of mind. On the way back I also took Quimby, which is I think the first time I've done that in both directions. So I must not have been totally wiped out. This ride was just under 62 miles, with 6500 feet of climbing. It was awfully slow, but workable. That's all I need. Yesterday I took a long ride through Big Basin State Park. I left the house at about 8:30, and headed up toward Summit the usual way, up Old Santa Cruz Highway. I rode up Mountain Charlie Road to Summit, Summit to Zayante, and then Zayante down to Felton. In Felton I had lunch, sitting at the covered bridge park. Then, for the first time, I rode up Felton Empire Road. Felton Empire is a two-lane road running, as the name implies, from Felton to Empire Grade. It starts off with reasonable grades, but as it runs into the woods it gets very steep. Closer to the top, the grade eases a little. On this Saturday, there was also substantial traffic. The Stanford cycling page lists this road as 3.7 miles at an average grade of 7.8%, which is roughly what I got. The most difficult kilometer of the day was in the middle of this section, with an average grade of 10%. On Empire I turned toward the north, continuing to climb but at a much reduced grade. The weather was practically perfect, but so cool that I was glad to have brought along my jacket. At the north end of Empire Grade I decided to explore the last little bit of the road, beyond Jamison Creek Road, where it dead-ends at the Lockheed-Martin facility. There wasn't much to see there. The Stanford page mentions a couple of "diversions" in this section, but if they're still there, I couldn't find them. I went gingerly down Jamison Creek Road to Route 236, where I took a left and headed into Big Basin State Park. At the park headquarters I wanted to fill my water bottles, but couldn't find any fountains or faucets. Surely there must be some? I ended up buying a couple of expensive bottles of water in the very busy snack bar. I wanted to rest a bit, but the headquarters area was so busy that there were no places to sit. Instead I continued on up Route 236 until I found a quiet spot in the warming sun. Refreshed, I continued the climb out of the park, and particularly enjoyed the sunshine near the intersection with China Grade. After descending to the intersection with Highway 9 I started the climb to Saratoga Gap, still feeling pretty good despite being beyond my normal range. On this cool day I was pretty well hydrated, and I had eaten plenty, which all helps. In any case I got to the top of Saratoga Gap and, for the first time in quite a while, saw the soda vendor there. I would have rewarded myself with a sugary drink, but I had spent all my cash at the park's snack bar, so I once again passed on by. I descended quickly to Saratoga, then took the usual route through Los Gatos and Kennedy to my house. Yesterday's ride was 84 miles, with over 9000 feet of climbing. That's a big day for me. Yesterday I spent the longest day of the year, and the traditional first day of summer, trying not to freeze. Here in the Bay area it's been hot over the past week, so when it cooled down yesterday I was eager to get on the bike. I got moving at 9 AM. I wasn't wearing a jacket, so the morning air was cool but of course it would heat up. I went down McKean and Uvas roads in perfect weather, then turned up Redwood Retreat on the way toward Mount Madonna. Along this road I had the clichéd bicycling experience of being chased by a barking dog, but in this case it was a short-legged and easy to ride away from. Scared me, though. As I was approaching Mount Madonna Road, I could see fog rolling over the mountaintop. As I struggled up the steep lower portions of the climb I didn't notice the weather much, but once the road becomes dirt it enters the shaded woods and became much cooler. As I neared the top it was thick with fog, so thick that condensed water rained from the trees. The south side of Mount Madonna Road is one lane and rough, so given the occasional wet patches under trees I was especially cautious descending. Nonetheless I got down to Hazel Dell Road, then around to Corralitos. After the long descent to Corralitos, I was thoroughly cold, and ate my sausage sandwich with coffee, just to warm up. But that didn't work, so I resorted to buying an overpriced but very comfortable hoodie from the market. Comforted inside and out by the new hoodie, I reversed a path that I've ridden a few times before. I went west on Hames, then took Day Valley Road to Valencia, and into Aptos. I crossed Route 1 on Spreckels, then rode through the residential neighborhood, stopping briefly at Seacliff State Beach for a lovely view. I took McGregor Drive toward Park Avenue, which I rode into Capitola. On the beach were dozens of kids participating in what I think was a lifeguard camp, with dozens more parents looking on. I left Capitola on Bay Avenue, which turns into the Soquel/San Jose Road. I've ridden down this road many times, but this was the first time I'd gone up. As usual, it looked like a completely different road, entirely unfamiliar to me. On this weekday there was lots of traffic coming down the road, but little going up. On one long section they were repaving the road, which further cut down traffic. I enjoyed the ride, with its consistently moderate grade, very much. Once I got to Summit, I returned home in the familiar way, down into Los Gatos and then across to Almaden on Kennedy. This ride was 80 miles, with 5300 feet of climbing. I was out for 8 hours, pedaling for 7. The most difficult kilometer was on the lower, paved part of Mount Madonna Road, with an average grade of 10.9%. Well, that was dumb. When I rode the Hamilton/Livermore loop, I met some folks who rode over Mount Hamilton to The Junction for lunch, then returned over Mount Hamilton. That hadn't occurred to me before, but seemed like a reasonable way to climb the back side of Hamilton. So I did that yesterday. Did you know that The Junction isn't open Mondays? Well, I didn't. I drove to the base of Route 130 and started riding a little before 9:30. I had both the parking lot and the road to myself, which I suppose should have been a hint of things to come. I made pretty good time (for me) up to the observatory, and stopped for a bit to eat a banana and drink a couple of cans of fruit drinks from the vending machine. After dropping down the back side of Hamilton, the hills along San Antonio Valley Road looked particularly parched. The thermometer on my computer was consistently registering over 100 degrees, although it was probably no more than 90 in the shade. But the heat was certainly getting to me. There were lots of cows along this stretch of road, sometimes grouped in the shade of oak trees, sometimes drinking from nasty looking pools. There were no people to be seen, apart from the very rare passing cars. There were no other cyclists. Shortly after I rounded the bend to turn north, I saw a coyote crossing the road, entering a field of cows. I'm sure healthy cows can't be bothered by coyotes, but what about isolated bike riders? I gave him a nice wide birth. San Antonio Valley Road rolls a bit, and as I strained to climb these little hills I dreaded the idea of the 2000 foot climb in my future. If I was having a hard time on a short uphill, how would I ever get up that mountain? Finally I got to The Junction, and found it closed. It shouldn't have surprised me, since I've seen the web site before. Ah well. Rather than enjoying a nice sandwich and stocking up on drinks, I ate two food bars and drank some of my suddenly precious water. On the way back I conserved water, but nonetheless I arrived at the base of the climb with very little water remaining. Putting this in perspective, I had already drunk 3 bottles of water and 3 cans of fruit juice, so I wasn't in danger. But it was hot, my mouth was dry, and there wasn't much shade on the climb. I had heard that there was a spring somewhere on this road, but I had no idea where. I had ridden down the road twice now without noticing it. I thought the most likely place was in the valley at the foot of the climb, but I saw nothing there. As I started up the hill I squinted into every corner, hoping to see something. Eventually I decided that I had either passed it, or it was no longer there. The front side of Hamilton was built such that mules could haul construction supplies to the peak, so it's not too steep. I don't know when the back-side road was built, but it was not required to be mule-compatible, and is therefore much more steep. I measured the back-side climb as about 4.4 miles with an average grade of 8.4%, with about 2000 feet of climb. For comparison, the last climb up the front side also climbs 2000 feet, but in 6.4 miles with an average grade of just 6%. I had dreaded these steep ramps, but in the event it wasn't so bad. I was going slow, but I think a large part of it was the heat, and not incidentally my worry about water. The climb begins at about 2200 feet of elevation. By the time I got to about 3100 feet I had long since given up on the idea of finding the spring, so naturally there it was, sitting off in a corner next to a convenient pull-out. A metal pipe runs down from somewhere, probably heaven, and pours into a cistern, which then drains into a creek. I was overjoyed. I drank a full bottle of water as I stood there, rested a bit, and left with refilled water bottles and confidence. After the spring, there seemed to be more shade on the road, either from trees or because the afternoon was wearing on. With virtually no traffic on the road I could pick and choose from the left or right sides on which to ride. Near the top of the climb the road gets a little steeper, and in fact the most difficult kilometer of the day was near the very top of the climb, with an average grade of 9.3%. I climbed back up to the observatory again, mainly to revisit the vending machine for two more fruit drinks. Then it was mostly downhill to the car. Yesterday's ride was 74 miles, with over 8100 feet of climbing. I think I would have enjoyed it much more with a nice leisurely lunch in the middle. Yesterday I escaped from the heat of San Jose by riding among the tall trees in Big Basin. I got started just before 10, riding through Los Gatos to Saratoga, and then up to Saratoga Gap. Most of the climb was shaded, so despite the temperature I was comfortable. I went straight through to descend down the west side of Highway 9, and took Highway 236 into Big Basin. I continued through the park, and into Boulder Creek. At one point I was toying with the idea of climbing Jamison Creek Road and descending into Felton, but I didn't think I had it in me. So, after stopping for a burger, I rode into Felton on a very busy Highway 9. In Felton I took Zayante northward, climbing first to about 1100 feet on the steepest climb of the day, and then climbing the rest of the way to Summit. At Summit I could have descended nearby Bear Creek Road, but I was enjoying myself and decided to take the opportunity to enjoy Summit Road. I took that to Old Santa Cruz Highway, and home the usual way. This ride was just over 77 miles, with 6600 feet of climbing. By the time I got home it was getting cool in the late afternoon, so I had escaped the heat by riding around in it. On Tuesday I bid farewell to my family, rode to Santa Cruz, said hello to the same family, and then returned home to see them again. Pointless, you might say, but satisfying. Now that the kids are out of school, the family took advantage of a hot day (in San Jose) to enjoy a warm day (in Santa Cruz) on the beach. I thought it would be novel to stop by and see them, in the course of an otherwise normal ride through Santa Cruz. I got moving at about 11:30. It would have been earlier, but it seemed important to know whether the family was really going to the beach or not, and they didn't firm up their plans until then. For my part, I don't recall having another route in mind. I left the house some time before they did. I took the same ol' route through Los Gatos, then up Old Santa Cruz Highway to the Soquel/Santa Cruz road and Capitola. I rode west along the beachfront, riding past Betty Burger for the first time in quite a few trips. When I got to the Santa Cruz boardwalk I texted my wife, and she met me with a sandwich and some watermelon. The kids were all on roller coasters. I rode back to the river, then along the river path to the bridge, and then Ocean Street and up Graham Hill Road. At Lockwood I cut over to Scotts Valley, where I filled up on water and tea. Then it was off to Bean Creek Road, which drops a hundred feet or so before climbing up to 800 feet, pretty steeply. After a short descent on Glenwood you get to the start of Mountain Charlie Road, which climbs up a skinny, pot-holed single-lane road, mostly at a reasonable grade but with a few steep ramps in the middle. One of the nice things about Mountain Charlie Road is that, near the top, you are rewarded with a mile or so of basically flat riding through a lovely wooded area. If you can ignore the noise from nearby Highway 17, it's ideal. I descended the north side of Mountain Charlie Road, then rode through Los Gatos and Kennedy home. The family had already arrived. This ride was 69 miles, with 5000 feet of climbing. It's something I've done several times before, but it was oddly enjoyable to meet the family at the far end. On Monday I took a field trip up the peninsula to ride some less-familiar roads. I normally ride from home, so as a change of pace I drove up to Palo Alto to experience some of the roads up thataway. I drove up to Sand Hill Road, and was riding the bike by about 10:30. I rode up Old La Honda Road. On this hot day, I appreciated the shade on Old La Honda, and didn't regret the lack of a view. I must admit that, on this well-known climb, I found myself trying to maintain a faster pace than I normally would (I was happy with my time, but it was quite slow compared to others). When I got to Skyline, I crossed over to the other side of Old La Honda, and thought that this must be one of the prettiest roads around. I continued down 84 to San Gregorio, with the temperature falling from the 90s to the 70s. I stopped at the San Gregorio store for a sandwich. I had forgotten that they only had pre-made egg salad, but it was fine. From there I headed up north on Stage Road, and when it met up with Route 1 I continued north on that road, too. Shortly after Route 1 dips down and crosses Tunitas Creek, I turned on Tunitas Creek Road and headed inland. Tunitas Creek Road runs relatively flat among farms and vineyards for a few miles. Just before it intersects with Lobitos Creek Road it begins climbing quite steeply. At the same time, it becomes increasingly wooded, starting with live oak and eventually running among towering redwoods. This part of the road is very steep, averaging about 8%. The most difficult kilometer of this ride was in this section, averaging over 10%. At 1500 feet of elevation the grade eases quite a bit. I rode up to Skyline at 2000 feet, then turned south and continued climbing up to about 2300 feet. After that it was mostly an easy descent to 84 at about 1500 feet, then back down the way I came. This ride was a surprisingly short 46 miles, with 4400 feet of climbing. 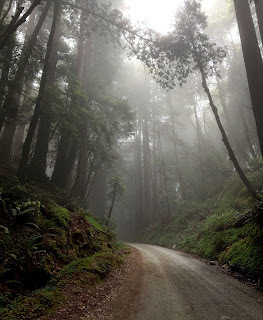 I was pleased that Old La Honda felt easier than it had on my first attempt, and Tunitas Creek Road was truly lovely. Yesterday I took advantage of my window of opportunity to ride my bicycle up Mount Tamalpais. I started by driving to a little parking lot just on the north side of the Golden Gate Bridge, at the end of Alexander Avenue. I'm completely unfamiliar with the area, so followed the route recently described by Bill Bushnell, which appeared to be comprehensive. It would take me all the way around the mountain, offering lots of different experiences and a reasonable distance, for me. I got started a little after 10 AM, on a clear and cool day. Alexander Avenue crosses under the highway and then becomes the main drag through Sausalito, after changing names several times. It was here I found that I had not properly calibrated by altimeter, since it was reading 70 feet below sea level on Bridgeway Road. I suspect it was reading 100 feet too low. Just as northbound Bridgway gets consumed by the highway, a bike path appears to carry you through the marshes at the top of the bay. After a modest number of wrong turns, I managed to Camino Alto, which climbs over a hill into the town of Corte Madera. 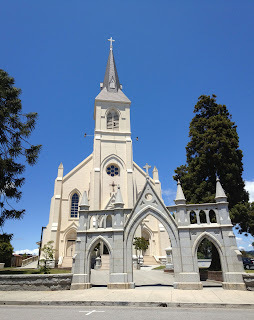 These towns up here all seem to have really well-defined downtown areas, and after Camino Alto turned into Magnolia, it passed pleasantly through downtown Corte Madera. A little farther north I got to Bolinas Avenue, a little earlier than expected, and turned to ride up the mountain. But this was the wrong Bolinas, it turns out, so I returned to San Anselmo Avenue and continued north. A couple of miles and one town further north, I got the right Bolinas and headed west. Bolinas starts the real climbing, reaching 1000 feet after a climb of about 3 miles, with an average gradient of about 5.5%. It climbs along a steep ridge with lots of houses. The houses have little decks on which to park cars, then stairs down to the houses below. Bolinas climbs past a county club, tops a ridge, then descends through thick woods toward Alpine Lake, about 400 feet lower. Alpine Lake is a stunningly pretty reservoir surrounded by thick woods. On this Thursday I had the whole thing to myself, or nearly so. I took this opportunity to eat a little pseudo-food and contemplate just how lucky I am. The climb away from the lake is perhaps the prettiest part of this ride, climbing up switchbacks on a heavily wooded ridge. It reminded me of the upper part of Black Road. While it seemed steep at the time, it appears to average a grade of only 5.9%. The most difficult KM of the day was in this section, with an average grade of 8%. Bolinas Road meets Ridgecrest Boulevard at about 1500 feet. Ridgecrest is level for a bit, and then climbs out of the woods and starts running along a grassy ridgeline, climbing to the 2000 foot level and then leveling off again. The views from Ridgecrest are spectacular. Toward the west is the Pacific, toward the east are the mountains, and a little further along Ridgecrest, you get postcard views of San Francisco. Looking west from Ridgecrest. Bolinas is in the lower-right. At the intersection with Pan Toll Road, Ridgecrest begins a climb to the peaks. The climb to the west peak takes you up to about 2500 feet, with a grade of 6.7%. In compensation, you get lovely views of San Francisco and the bay. There's a saddle between the west and east peaks that has some of the steepest ramps I saw on the day. While the east peak is higher, as far as I can tell the road is actually much lower. I think to get to similar elevation you have to take one of the many trails. I got my fill of the views and refilled my water, then headed back down. Well, first up to the west peak, then down. I took the steep Pan Toll Road down to the Panoramic Highway, then dropped through a series of residential roads into Mill Valley. This must be the more popular route up Mount Tamalpais, because I passed dozens of riders coming the other way. At the end of Miller Road I got back on the bike trail, and reversed my steps back to the parking area. By this time it was the late afternoon, and the west side of the Golden Gate Bridge was open to bikes. There were so few bikes that I doubted my luck, thinking it must be a mistake. The wind on the bridge was fierce, blowing in some mist. When I stopped to take some pictures, the wind blew over my bike and threatened to blow the camera out of my hand. Nonetheless, the views were great, and the lack of traffic was an unusual treat. I returned to the car and began the long trip home, now firmly in rush hour traffic. It was well worth it. Elevation profile. This appears to be about 100 feet low. This ride was almost 55 miles, with 4300 feet of climbing. Had I planned the climb myself, I'm sure I would have taken the shortest route, and missed the lovely Alpine Lake. Perhaps next time I can the same thing in reverse, or maybe a route incorporating Stinson Beach. Yesterday I climbed Empire Grade for the first time. Empire Grade isn't the most convenient road for me. It's far away, and of course it's another climb. Until recently I couldn't manage to climb over the hills to Santa Cruz and then back again, so adding another climb on the far side was out of the question. But lately I've had more range, so I thought I'd give it a shot. I started out at about 9:30, and followed my normal route up Old Santa Cruz Highway, then into Capitola on the Soquel/San Jose Road. I enjoyed the breeze along the beach, and briefly watched the omnipresent surfers near Opal Cliffs. After lunch, I headed up the San Lorenzo River trail to Mission Street. 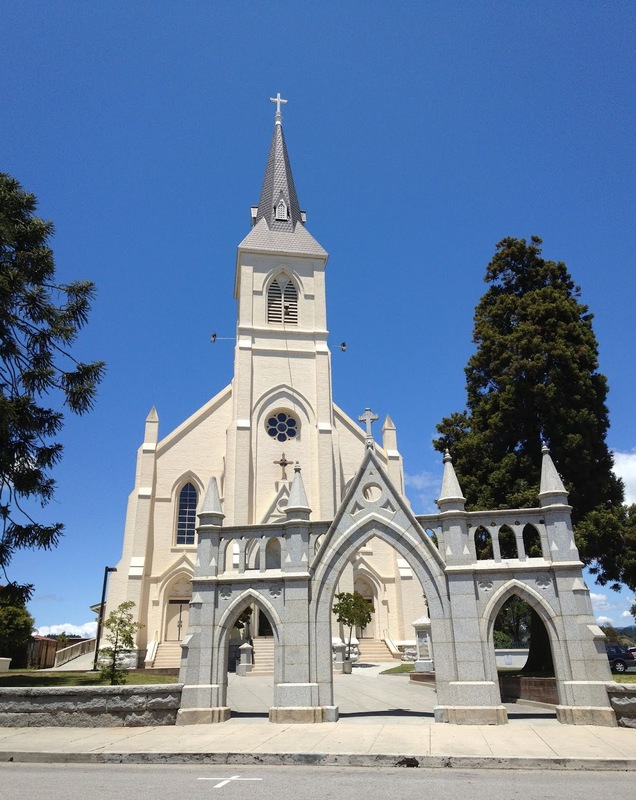 High Street, which turns into Empire Grade, begins at the site of the Santa Cruz Mission, now Holy Cross Church. There's a small replica of the original mission on the site, but one thing I missed is that apparently one of the original buildings is still standing. Maybe next time. After stopping for a few pictures, I crossed the pedestrian bridge over Route 1 and headed up the road. High Street starts climbing immediately, at a gradual grade, and quickly enters the extended grounds of UCSC. Shortly after the west entrance, the road makes a steep climb up to about 1000 feet. In fact, this turned out to be the most difficult kilometer of the ride, averaging a grade of 9%. At that point it levels off, until a mile later the road takes another steep climb up to 1800 feet. Along this steep stretch, on Bonnywood Way, there was a giant dragon off the side of the road. At least I think there was; perhaps I was lightheaded from the climb. The road then levels off again until, at the intersection with Ice Cream Grade and Felton Empire Road, it begins a more gradual climb up to its peak near 2600 feet. According to a history of roads in the Bonny Doon area, Empire Grade was constructed by the Empire Mining Company in 1872. Empire Grade was the main road, but as it's a long way down to Santa Cruz, eventually roads to Ben Lomond and Felton were built to serve the farms and ranches on the ridge. Empire Grade offers few views until, near its highest point, the trees clear so you can see the Skyline ridge and surrounding hills. The top of Ben Lomond Mountain is occupied by some sort of prison, which may have a nice view of the bay. I probably should have continued to the dead-end of Empire Grade, while I was here, but it was getting late and I still had a long climb ahead of me. Instead, I descended the steep and twisty Jamison Creek Road, which starts off a little rough but becomes a smooth, two-lane road. It meets up with Highway 236, which took me to Boulder Creek. After getting a drink at Johnnie's, I started up Bear Creek Road. The Tour of California followed this same path, from the top of Empire Grade up to the top of Bear Creek Road. I watched from the top of Bear Creek Road, but seeing those guys descend Jamison Creek Road would have been a treat. This was my first time climbing the south side of Bear Creek Road. I climbed the last part of it once when I took a wrong turn, and I've come down the road several times. Nonetheless, climbing the road was entirely unfamiliar. I was hitting the road around 5 PM, but there wasn't much traffic heading north. Still, this is a pretty lousy road to climb, with too much traffic and no shoulder. The lack of shoulder is especially troublesome because there are steep sections on which it's hard to maintain a steady line. Once I crossed the Tour of California's KOM point, I quickly descended the other side of Bear Creek Road, and returned home the usual way, over Kennedy. Yesterday's ride was a little over 84 miles, with 7500 feet of climbing. I was out for 9 hours, and on the bike for 8. A long day, but I got to see two new climbs, which is worth it. Yesterday I rode my first century of this century, in the form of the Hamilton/Livermore loop. One of the first times I ever climbed Mount Hamilton, I found myself riding the last couple of miles with another tired-looking rider. He told me that he had started out in Livermore, and while I didn't really know where that was, I knew it was pretty far away. Since then I learned that the loop over Hamilton and through Livermore was popular. Last week I tried to do this same ride, but it was just too cold for me. Yesterday's weather looked perfect -- warm but not hot. I drove my bike to the Berryessa Community Center, and managed to get started at just about 8 AM. The air was cool and especially clear, and I made my way up to the observatory with no incident. Despite the perfect day, there didn't seem to be many riders on the climb, although once I got to the top there were plenty of them. The views were amazing, better than I've ever seen it before. With the clear air you could see individual buildings in town. The curve of Monterey Bay was visible to the south. The wind was fierce, which is normal on the summit, but not too cold. I wandered around the observatory for quite a while, and drank three cans of some juice drink from the vending machine. Finally I went down the driveway, filled my water bottles, and headed down the back side of Hamilton for the first time, off into the unknown. There were lots of riders crawling up what I understand to be the more difficult side of Hamilton. The Stanford cycling page mentions that this descent is more challenging than the other side, but since I go pretty slow it didn't seem noticeably different. The road levels off at about 2000 feet, which I hadn't actually expected. 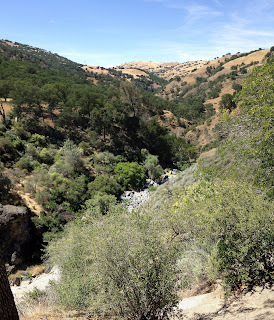 I had assumed that the elevation of the climbs on both sides of the mountain were similar, but it looks like the backside, while steeper, is more like 2300 feet, rather than the 4500 feet when coming from San Jose. San Antonio Valley Road climbs gradually to perhaps 2300 feet, reaching this local maximum very near the point at which it turns northward. The road twists a lot, and I passed through this eagerly anticipated turn without recognizing it at the time. At some point I realized I was in a much wider valley and had been seeing my shadow directly under me for quite a while, and finally twigged on. About 37 miles from the start of Route 130, I arrived at The Junction, the only food stop on this long road. I had a BLT in the company of perhaps a dozen other bike riders and several motorcyclists. The bacon was really quite good, so the sandwich was great. I talked to a pair of riders who had also come over Hamilton, and who surprised me by heading back that way. I hadn't even considered such a thing, but now I may try that myself. If I ever want to climb the back side of Hamilton, it's certainly more realistic (for me) than a clockwise Livermore/Hamilton loop. The wind was kicking up, several times forcing me to chase down napkins or my plate. And naturally it was blowing from the north. Mines Road, north of The Junction, heads up. At first it's gradual, then a little steeper as it approaches 2700 feet. Then it drops a bit before climbing right back up, reaching the high point of Mines Road at a little over 2800 feet, five miles north of The Junction. The wind continued to blow down the valley, which was an unusual experience for me. Riding in the Santa Cruz Mountains I'm normally sheltered from the wind. In this section, I found that I didn't really mind the wind, despite its strength. I was either headed uphill, in which case it didn't matter, or downhill, when it just slowed me a little (but I was in no hurry). Had I been riding on flat roads I suspect it would have been a different story. As I reached the high point of Mines Road, still 25 miles from Livermore and riding into substantial headwinds, I was sure that I would call my wife for a rescue in Livermore. But after that high point the road slopes gently downward, giving one an unearned feeling of strength and minimizing the impact of the wind. Before long my confidence had returned, and I was sure I'd complete the ride. As you ride north, you go from a scrabbily wooded valley to the familiar grass-covered, rounded hills, already dormant for the summer. The road turns from generally northward to generally westward, and as it did so the wind increased. But in this section the road also begins dropping more steeply, so I was able to marvel at it. I wonder if it's always this windy? When I got to Livermore, I realized that, based on the direction the various flags were blowing, the wind was now coming from where I wanted to go. This seemed entirely unreasonable to me, mostly (in retrospect) because I hadn't understood the route. I thought I had approached Livermore from the south, but in the windiest section I was actually heading west. I thought I would be heading south again, but Highway 84 heads southwest. So the wind, blowing basically toward the east, was largely against me, but it appeared to me that it had turned around to face me, personally. I rode across town on Concannon, a generically suburban road, and stopped at Subway for some drinks. Then I headed south on Holmes Street, which turns into Vallecitos and then meets up with 84. This section was easily the most difficult part of the ride. Highway 84 climbs over a little pass on its way toward 680, and the wind blasted through it like a wind tunnel. The road climbs only a couple of hundred feet at a low grade, but this was easily the hardest climb of the day. So much for my idea that wind doesn't matter on the uphill. Between the wind and the loud traffic, I didn't like this section at all. After descending to the intersection of 84 and 680, I took Calaveras Road south, toward the reservoir. Signs warned that the road was closed until next weekend, but I had read somewhere that it was open during the weekends. Of course the signs gave no such indication, so I was a little worried. Nonetheless, the wind and traffic noise was gone, and I was determined to enjoy the road even if I had to turn around. The gate was indeed open. At this point I was about 85 miles into the ride, in the cooling late afternoon. Calaveras Road, running along the east side of the ridge, was largely shaded, and finally free of the hateful wind. The whole run next to the reservoir felt like a reward, from the gentle climb to the twists and turns among the hills. I had dreaded the climb up to this road, but in the event it was perhaps the most satisfying part of the ride. By the time I got to the steep and surprisingly long descent into Milpitas, I was renewed. I rode south on Piedmont to Berryessa, and was gratified to see that the odometer ticked over 100 miles before I got to the car. I was fully prepared to ride in circles if I had to, but I was spared that indignity. The ride was 100.3 miles, with 7800 feet of climbing. It took me almost 11 hours, 9 of which were in the saddle. The most difficult kilometer was definitely climbing over the pass on 84, but since my little analysis program doesn't know about wind, it settled on a stretch near the top of Hamilton. That just goes to show how gentle rest of the climbs were. I know there are plenty of folks who bang out this kind of ride on a typical weekend, but for me this was a big achievement. My last century was nearly 20 years ago, and it was dead flat. As I write this a day afterward, I'm a little tired but not completely drained. A good, long, day out. On Tuesday I enjoyed a bike ride to Big Basin, this time taking the "short cut" on China Grade. When I'm looking for a nice long ride, lately I've turned to Big Basin. For me it's near my limits in terms of length and climb, and it's a really beautiful area, to boot. As I ride through there, I see several other roads I've heard of, but never visited, including Jamison Creek Road and China Grade. Today's goal was to visit China Grade, even though that meant missing some of the prettiest areas of the park. I got started shortly after 10, and headed out the usual way over Kennedy to Los Gatos, then up to the dam. For no particular reason I took Bear Creek Road to the summit. It didn't seem especially busy on this weekday. Bear Creek Road is quite steep -- in fact the most difficult kilometer of the ride was in this section, with an average grade of over 12%. I got to the top in good order but a little drained, and descended into Boulder Creek. I had my (now usual) burger at Foster's Freeze, then headed up Big Basin Highway. China Grade peels off from Big Basin Highway at about 800 feet of elevation, then climbs very gradually through a residential area. The houses grow more sparse and eventually disappear, and at about 1000 feet of elevation you enter Big Basin State Park. At that point, the road turns upward. In the next 1.5 miles you gain 800 feet, with an average grade of over 10%. It looks and feels even steeper. Near the top a crew was laying down asphalt patches, which added a pungent accent to this otherwise quiet, isolated and fresh-smelling area. Once China Grade meets back up with Big Basin Highway at about 1800 feet, there's just a little more climbing to the peak of Big Basin Highway, then the drop to Highway 9. The climb up Highway 9 was long but, on this cool day, not at all unpleasant. I returned home the usual way, down Highway 9 (on which I caught both of the temporary lights) to Los Gatos, then across Kennedy and home. This ride was just a little short of 59 miles, with almost 5900 feet of climbing. That's about 10 miles shorter than other trips through Big Basin, since both Bear Creek Road is shorter than climbing Old Santa Cruz Highway to Summit, and China Grade cuts out much of Big Basin Highway. Still, those short-cuts are much steeper, and I think the longer route is both easier and much more satisfying.